question asked: May 03 '13, 9:06 a.m.
last updated: Sep 16 '13, 1:13 a.m.
How can I create a WorkItem in a certain RTC Project Area's Plan via REST API? Simon Eickel (1.1k●6●51●56) | asked May 03 '13, 9:06 a.m.
closed Sep 16 '13, 1:13 a.m.
one more problem facing with the synchronizer. I addd one more component to my working synchronization which should be synchronized from RTC to CC. The directory in CC was "moved" by project decision (so the old path was not correct and it should be synchronized to a different location). The old dir was removed (rmelem) and the new one was created containing the attribute for subvob components. As I knew the oid for the old dir was still inside the RTC database as a clone - so I deleted all clones for the component where the dir was changed. My problem is now that the synchronizer is still missind the element oid within the VOB. 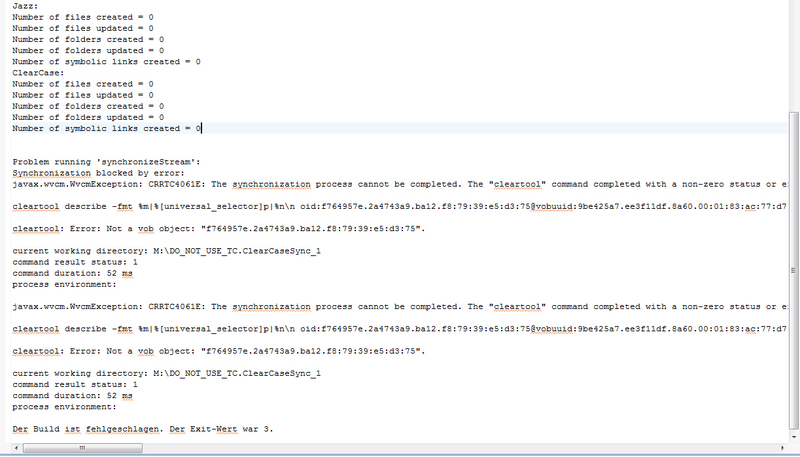 Even after removing the component from the sync the synchronizer is checking for the element oid and is throwing errors. I checked the whole database for a clone containing the oid (checked for each component itself and after this checked for the repository wontaining no special component name) ... all search was not successfull. I don't find a link to this oid and for that I don't know where he is remembering this oid. Any idea where I could search for this information? Simon Eickel commented May 03 '13, 9:21 a.m. The question has been closed for the following reason: "The question is answered, right answer was accepted" by eickel Sep 16 '13, 1:13 a.m.
Masabumi koinuma (461●1●5) | answered May 03 '13, 9:39 a.m.
Have you tried to remove the synchronization roots and add them back? It would probably be sufficient to remove just the roots at/under the component you're having trouble with, and add them back. Simon Eickel commented May 03 '13, 9:43 a.m.
what do you mean with removing and adding the roots? The folder /component which is causing the problem is not inside the syncer anymore. The folder in CC still exists and the Component in RTC, too. But the synchronization stream has this component / CC folder not to synchronize. Masabumi koinuma commented May 03 '13, 9:53 a.m.
Well, the stack trace indicates the synchronizer is having trouble with the active synchronization roots of the stream. If you confirmed you already removed the component's folders from the synchronization stream, I wonder if you happen to remove clone links ( ccc clone -X -c ) of other components inadvertently. One thing you can check is to run cleartool describe of the oid, and see what folder/component is troubling the synchronizer. Masabumi koinuma commented May 03 '13, 10:02 a.m.
Oops, cleartool desc oid, is the command that is failing in syc. Pls ignore the last line of my comment above! Simon Eickel commented May 03 '13, 10:05 a.m. I removed the component from the "Select Files and Folders" wizard , not from the synchronization stream itself. Now I removed this component from the stream itself and still have this problem. I did not remove clones from other components ... does this affect the other synchronization of components? What I read is that the files will still reside on their place ... does anything work when I recreate the clones during the next synchronization? Is it possible to remove all clones within the command (using it without -c <component>)? Simon Eickel commented May 03 '13, 10:10 a.m.
Masabumi koinuma commented May 03 '13, 10:34 a.m. The error message about backslash probably has nothing to do with your case. I have another theory based on your recent comments - I suspect you removed the element (cleartool rmelem) before you remove the synchronization root from "Select Files and Folders" wizard, correct? I can't think of other quick solution than to create a synchronized stream fro scratch and remove the current one in that case. Just a friendly reminder, but we do not support rmelem and rmver with ClearCase synchronizer. Oh, one possible workaround is to remove and add back an unrelated roots from the wizard. 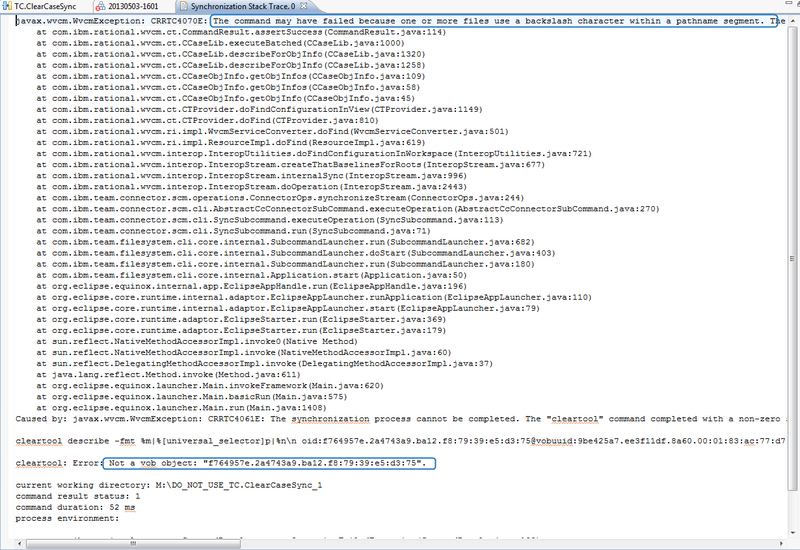 It may clean up the list of roots and related metadata from the synchronized stream. If it does not work, it would be best to create a new sync. stream. Simon Eickel commented May 03 '13, 3:33 p.m.
new sync stream means that I have to take a new name or can I name the new one like the old one? what do you mean with "add and unrelated root from the wizard"? Masabumi koinuma commented May 03 '13, 5:58 p.m.
Name of the new stream would not be a problem. You can rename the old one and create new one, or create new one first and you can change stream names afterwards, and the synchronizer continues to work fine. Masabumi koinuma commented May 03 '13, 6:01 p.m.
c) When you finish the wizard, it will trigger a new synchronization automatically. d) If the synchronization succeeds, it means you probably succeeded the cleanup of the synchronization roots and related metadata. You can add back the synchronization root that was removed by b), and next synchronization would work fine. e) If the sync. still fails with the same error, you probably don't have a chance to recover the existing synchronized stream. Then, the solution is to create a new synchronized stream with the same configuration as previous ( same CC branch type, label type ). Since you're mostly interested in the sync. from RTC to CC, it'd be handy to make a snapshot with the current sync. stream in RTC, and specify the snapshot in the last page of synchronized stream creation wizard. Simon Eickel commented May 03 '13, 6:47 p.m.
One more question regarding the rmelem. The problem was that a simple reconfigure the component inside the syncer did not work to the new dir. After this we did a rmname on the folder within CC - the effect was just that the syncer wanted to sync to the old dir in it's old place (not there) --> error. What is the recommended progress for this? How to change the component to a different folder (same name?) if I cannot use an rmelem or rmname or rmver? Masabumi koinuma commented May 03 '13, 7:15 p.m.
Hi Simon, can you elaborate more about the scenario? I remember you are using baseCC sub-VOB component, and when you said a simple reconfigure, what were you trying to accomplish? Were you trying to sync. out an existing RTC component to a new folder in ClearCase? Simon Eickel commented May 04 '13, 2:40 a.m.
thanks for explanation. This was exactly the scenario. 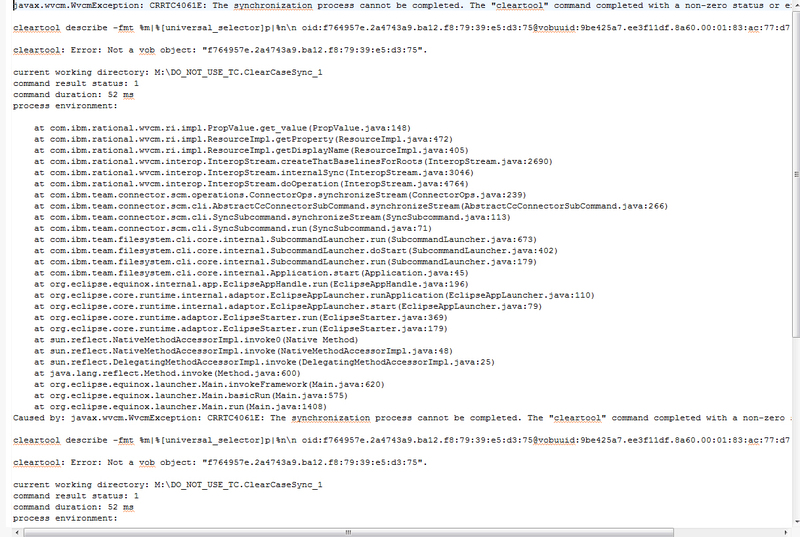 And on this configuration they have build scripts. Now they need to sync all data of RTC into CC for other teams using it within CC. But in CC they need the same folder structure as in RTC because of the build scripts. This is with the synchronizer by default not possible (because component is one folder and the top level folder itself is a folder). This is why we have a subfolder "DO_NOT_USE" where we sync the RTC stuff and at the same level next to the "DO_NOT_USE" folder we have the folder structure we need created as symlinks. Simon Eickel commented May 04 '13, 2:59 a.m.
after removing all Components from the sctream and syncing - syncer was successfull. Now I added the component I tried to sync after reconfiguration and started synchronization and now he created the directory next to the "DO_NOT_USE" folder again. So I'm back at the state where I was before I created this entry at jazz.net. - added it back to the stream. Simon Eickel commented May 04 '13, 3:13 a.m.
Simon Eickel commented May 04 '13, 4:44 a.m.